His name is Bob Benjamin, born of a Costa Rican mother and an American father. His first CD, “Do You Know”, was mostly recorded in Costa Rica by his production company, Traveling Light Music. The music of the movies was an early influence for Bob, who grew up in 1950s and 60s Santa Ana, Orange County, California- Hollywood's backyard, where his athletic abilities in high school and college were pointing to a professional baseball career. Bob's mother, Maria Violeta Zúñiga Campos, thought of life as one big Fred Astaire and Ginger Rogers movie and together she and young Bob watched the musicals of the 1930s and 40s, although The Beatles were the main musical influence in his youth. His music and voice are compared more to a mix between Cat Stevens and Neil Diamond. 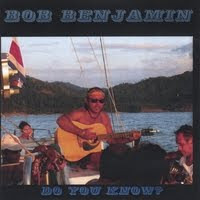 Bob moved to Costa Rica in 1999 after performing for years in Cambria, California in search of a more tranquil life and the opportunity to sing and write more songs. Since then, and equipped with only his smooth voice and his guitar, he has been charming audiences all over the country. Upon arriving in Costa Rica, he was lucky to meet Roberto López and Alvaro Esquivel, a music promoter and a producer respectively, who opened doors so that he could perform at The Grand Hotel, the Jazz Café, La Cava in Escazú, and the Marriott Hotels. Later, he tried his luck on the beaches of Tamarindo, Flamingo, Brasilito, Panamá, Potrero, Ocotal and Hermosa where he sang regularly at such venues as the Four Seasons Resort, the Best Western Crazy Monkey Bar Tamarindo, Cala Luna, the Happy Snapper, the Flamingo Marina Resort, Giardini Resort, Pasatiempo, Father Rooster, the Beach Club, the Upper Deck, Florblanca Resort in Playa Santa Teresa, San Jose and Lake Arenal. He has recently returned to the U.S. where he continues to perform, write, and record.